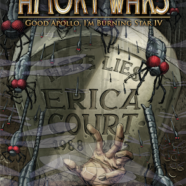 I had a rather unique opportunity to get my hands on a sneak preview of the new issue of “The Armory Wars: Good Apollo, I’m Burning Star IV.” This was the second issue in this on-going series. Whether you are a fan of Coheed and Cambria or not, this is definitely something that the average sci-fi fan can find as an interesting read. There is a general dark undertone matched with a somewhat dry sense of humor. The writing comes across as straight forward without any holes left in the ongoing story. The writer, Claudio Sanchez, has a very unique writing style of somewhat being in a different world but still making you feel part of what is going on around you. This comic series vaguely follows Coheed and Cambria’s album, Good Apollo, I’m Burning Star IV: Fear From The Eyes of Madness. There are nods to the lyrics and general story line that co-exist. Which, is a rather unique spin compared to how over saturated the comic book market has become. Claudio has always taken pride in this comic series. I have always seen him in the ‘Artist Alley” section of multiple comic conventions sitting and awaiting anyone that has an interest in meeting him. He is very approachable and I have even seen him talking and answering questions about his comic series. It is nice to see someone who is truly dedicated to their craft. I definitely would not suggest this comic series to any new readers of the comic world. There is a sense of advancement that one would not prepared for. There are no super heroes wearing underwear running around trying to save the city. We are dealing with a very dark and emotional story line that one must be fully vested in. I am very interested to see where this story goes as the ending of the second volume makes you wonder just what can happen next. Go out and grab volume 2 and the first one (if you haven’t already). Buy from your local comic shop!